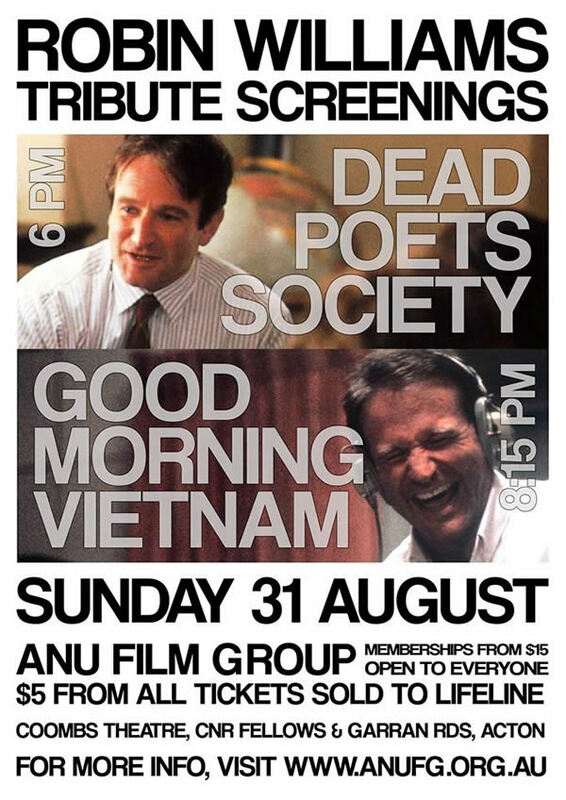 The ANU Film Group, Australia’s largest film society, will be celebrating the life and legacy of the late Robin Williams with a special tribute screening of two of his most beloved films – Dead Poets Society and Good Morning, Vietnam – on Sunday 31 August at 6 PM. Membership of the ANU Film Group is open to everyone, and will be available for purchase at the door from $15. In recognition and support of those battling depression, the ANU Film Group will be donating $5 from all sales made on the night to Lifeline Canberra. The ANU Film Group is a not-for-profit organisation that has been operating since 1966, screening over 150 feature films a year for the Canberra community, from the latest Hollywood blockbusters to foreign, independent and classic films not seen anywhere else. Located in the ANU just behind the National Film and Sound Archive, the 370-seat Coombs Theatre is fitted out with full cinema set-up with an 8.5-metre screen, professional digital and 35mm cinema projectors, and a digital surround sound system.